Up until the 3rd grade, I attended a small co-op that was essentially run by parents who hand-picked teachers -- one per grade level, of course. 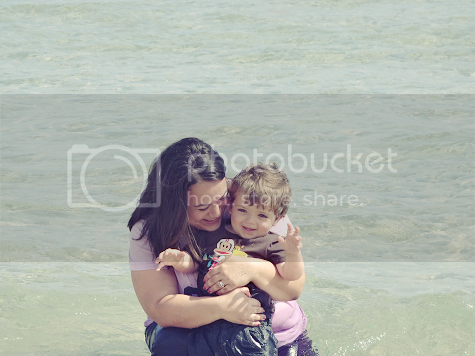 It was a very Kumbayah experience and one I've always hoped to recreate for Ethan when the time comes for him to attend school. Like most co-ops, the learning was very play and nature based. Emphasis was put on the senses, imagination and personal interpretation. I keep all of these fundamentals alive in Ethan's learning to this day and think it's fun when I can recreate something for him that I specifically remember doing as a child myself. 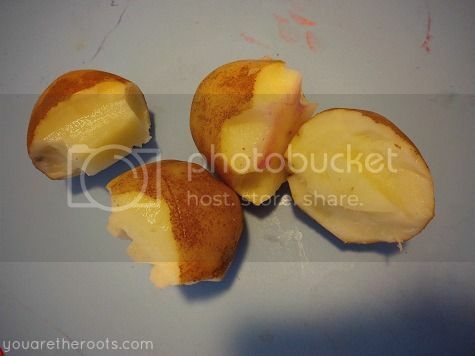 These potato stampers fit that bill. 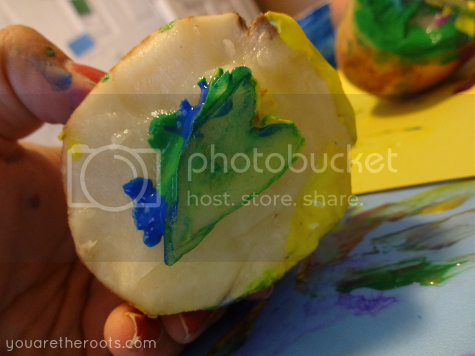 I can clearly remember stamping with carved baked potato halves despite the fact I likely was no older than 4 or 5. This is increasingly strange considering I couldn't tell you what I wore yesterday or what I ate for dinner two nights ago, but I suppose these are the foundations for learning that parents and teachers hope cling to you as you grow older. 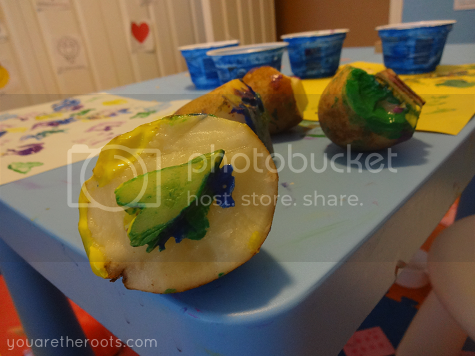 I thought of these potato stampers a few days ago when Ethan and I were at the grocery store and he was completely hellbent on selecting baking potatoes from the produce display despite the fact we already had potatoes at home. 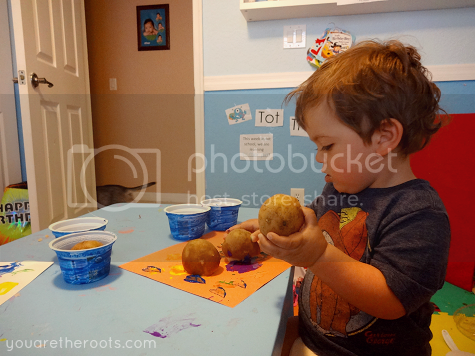 This activity popped in my head and I let him select some potatoes, excitedly preparing myself for the fun we'd have after naptime. 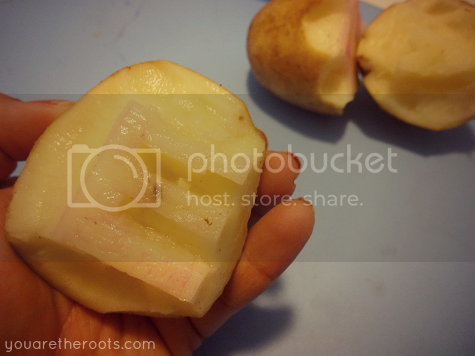 Of course, what you don't recall from your childhood is the precision it took to carve the potatoes. Something about life being easier when you're a child and an adult does all the dirty, sharp, dangerous work for you. With four potato halves to work with, I carved a rectangle shape, an "E" for Ethan, a heart and a starburst (which was supposed to be a star but, well, I'm not the best at these things so I improvised). 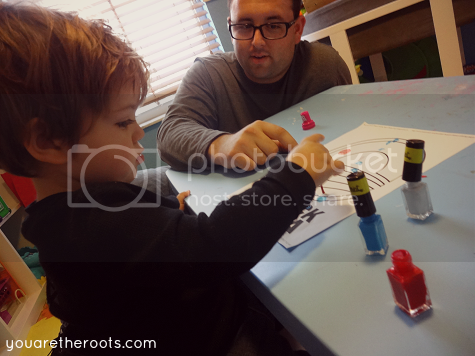 Ethan had an absolute blast stamping with the potato stampers. I had an absolute blast listening to him attempt the word "potato." We've been taking the week off from life to work on keeping Ethan strong and healthy after a run-in with a cold that didn't leave him desperate for breathing treatments for the first time ever, and I'd be lying if I said this week wasn't absolutely fun in spite of Ethan not feeling his greatest. 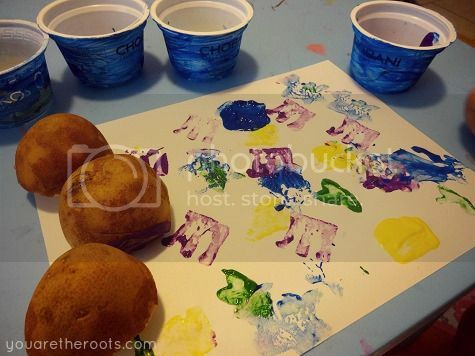 My little artist may have selected a new favorite art tool: potatoes! 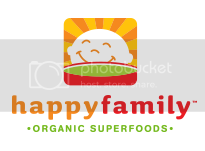 The Happy Family brand is synonymous with quality and organic goodness in the parenting world. 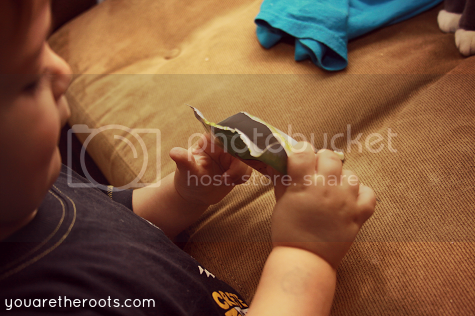 Though I did make all of Ethan's baby food when he was infant, I still relied on Happy Baby for their organic puree pouches for the occasional feeding-on-the-go and, oh, their puffs. 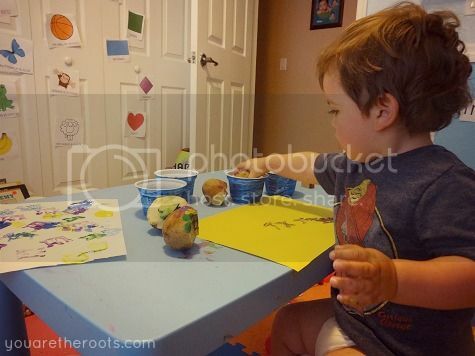 I did a review for Happy Baby in the past when Ethan's world was consumed by their puffs! 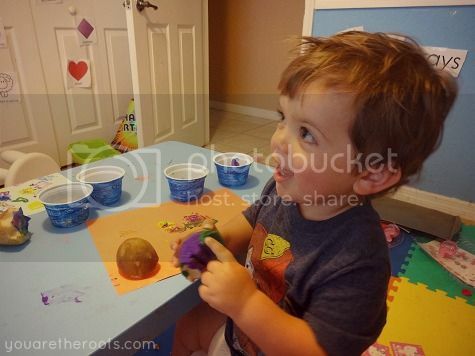 Happy Family offers organic products that are able to grow with your ever-growing little one and Ethan was super excited about the opportunity to try out some products from their "big kid" package. 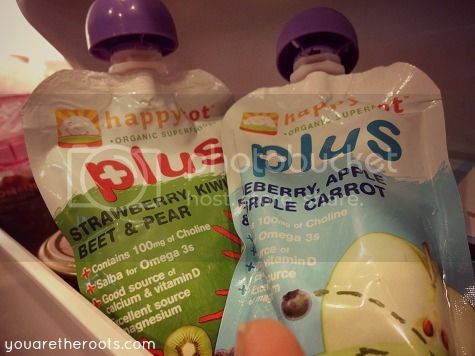 The first items Ethan tried were the Happy Tot Plus pouches and a Happy Morning organic breakfast smoothie -- the latter of which didn't even make it through the parking lot of the grocery store before he completely inhaled it. Each Happy Morning breakfast smoothie is packed with as much protein as an egg and a full serving of fruit. Ethan very much enjoyed the super cinnamon with pear and raisins and I was surprised that it did keep him filled up until he was ready for an early afternoon snack before lunchtime. I'm not a breakfast person and apparently neither is Ethan. He usually prefers grazing or munching on fruits in the morning rather than an actual sit-down breakfast, so this yogurt smoothie (which is packed with antioxidants!) was the perfect alternative. Plus, it contains quinoa as a protein source which is a huge, healthy plus! 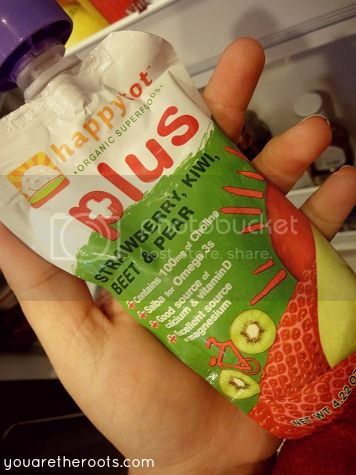 The Happy Tot Plus pouches are different from a standard fruit puree pouch because they contain Salba (a supergrain!) and are fortified for Choline for the ultimate nutritional boost. 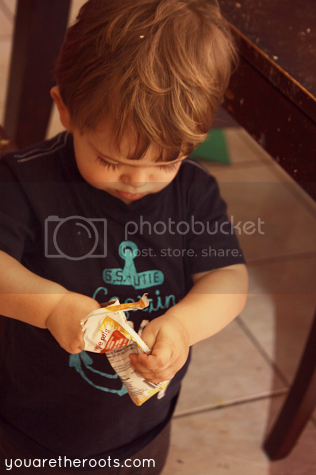 Ethan enjoys these Happy Tot Plus pouches as the perfect afternoon snack. His favorite so far seems to be the strawberry, kiwi, beet and pear flavor. 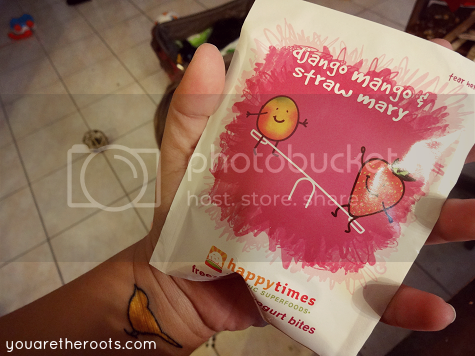 We also tried three flavors from Happy Family's organic individually wrapped snack line called Happy Times. The individually wrapped packets of Happy Times snacks are a welcomed addition to our busy and on-the-go lives. The majority of individually wrapped snacks on the market tend to be sugary and filled with artificial ingredients whereas Happy Family snacks are filled with organic, natural goodness. 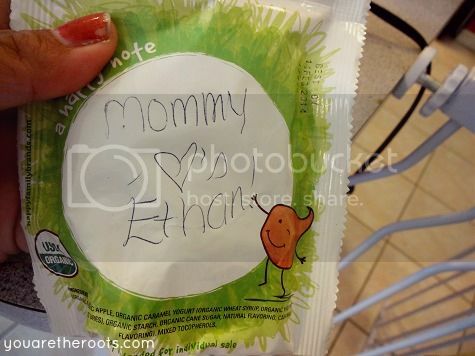 One of Ethan's absolute favorites that we tried were the Veggie Pals. They're carrot, orange and apple gummy chews and I'd be lying if I said I wasn't a little hesitant before I chose them off the shelf. When I think "gummies," I think sugar and food coloring and all that other yucky stuff that I like to keep out of Ethan's diet. I should have known better. 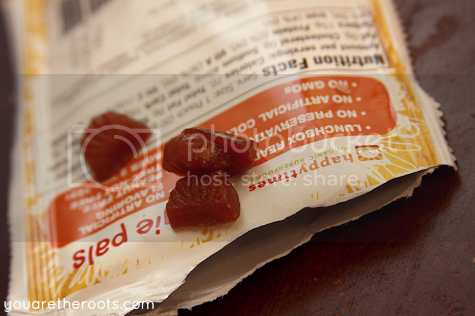 The truth is, Happy Family's Veggie Pals are the only gummy in the world that contains veggies. The ingredients are strictly fruit and vegetable purees and juices -- all USDA organic, of course! 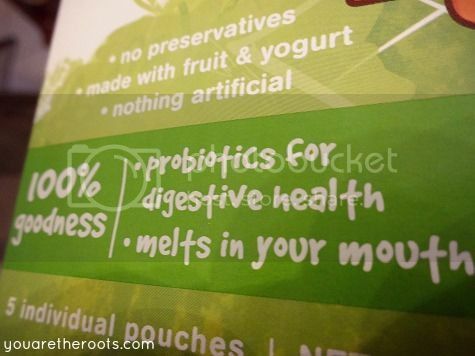 No GMO's, no preservatives - the way snacking should be! Happy Family also sent us one of their adorable tote bags, which you may have noticed being displayed in Ethan's Tot School classroom. 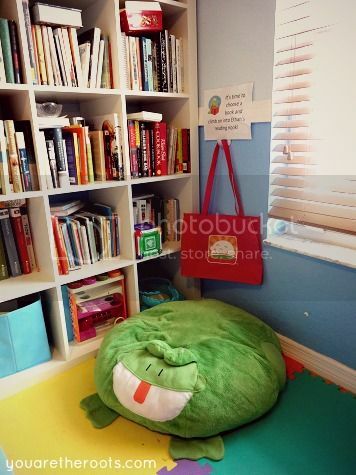 The tote bag is perfect for Ethan to take on trips to the library or to the grocery store, helping him learn the importance of eliminating the use of plastic bags. All in all, we are huge fans of Happy Family's "big kid" snack line (I'm doing my best to keep my composure that my little dude fits into that category these days!) and have already purchased most of the items that we were given the opportunity to try. I can understand how healthy snacking can be a little harder as the toddler phase begins and I love that Happy Family is eliminating that worry! Of course, healthy snacking doesn't have to end with toddlers. 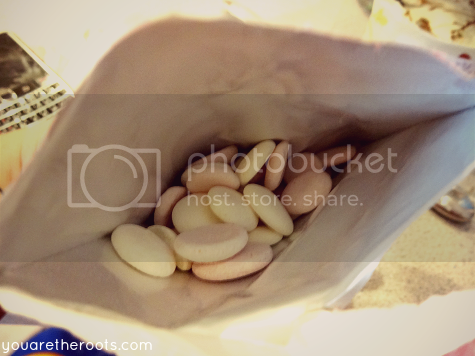 My husband happily shared a bag of the Mixed Fruit Yogi's with Ethan on the way home from the beach this past weekend! 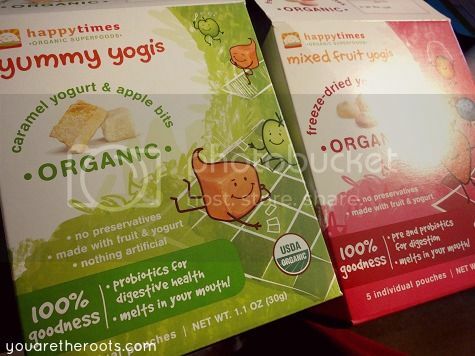 TO BUY: Happy Family foods are available at Whole Foods, Super Target or other major retailers (or, in my case, I found the most products at our local health food store -- shout-out to Tunie's in Coral Springs, Florida!). To find a store near you that carries Happy Family products, here is a store locator. 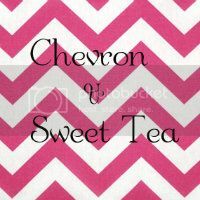 Free product coupons will be sent for all food items. Ethan woke up on Sunday with a cold. I've come to dread that initial first sneeze, the first sniffle, the first word from a just slightly hoarse enough voice to make my heart start to sink with dread. Just please don't let this go to his lungs. And so far it hasn't, which is something I've feared jinxing by putting into words, but I'm trying to simply have hope. 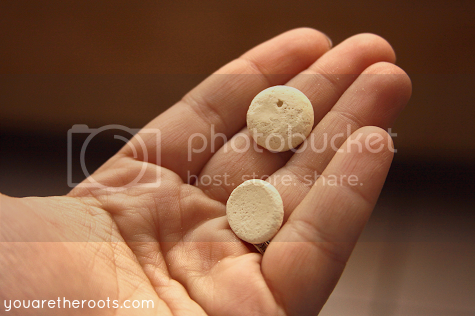 You know, hope in the twice-daily corticosteroids that we've managed to squeeze into our routine just before breakfast and just before bedtime. Like all native South Floridians, I'm convinced that there are healing powers in the beach. There's nature's medicine permeating through the salt air and nothing but goodness in each tiny of grain of sand, in each splash of saltwater against your skin. A sick day means a beach day, means traipsing through the fluffy early morning sand underneath the bright, blue morning sky. 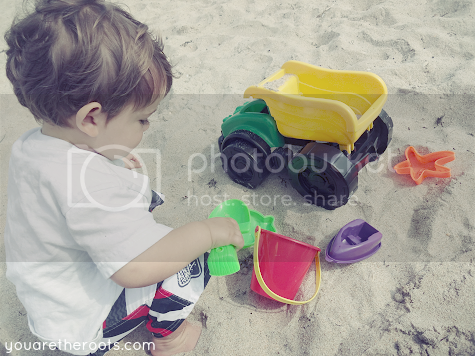 It means Ethan's little hands coated in wet sand, munching on an orange as juice drips down his chin. It means a nose like a faucet and somewhere in that, the present hope that all of the germs will fall victim to the magical healing powers of the salt air. 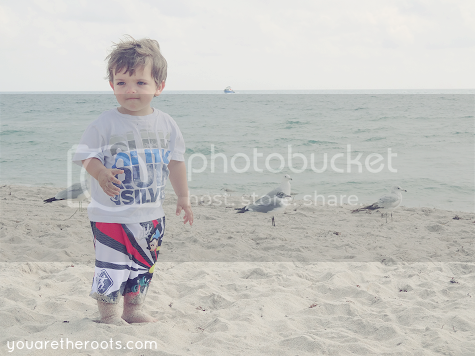 We've spent the past two mornings at the beach until the afternoon sun becomes too unbearably hot to stand. A typical Florida winter, a usual February in Palm Beach county. 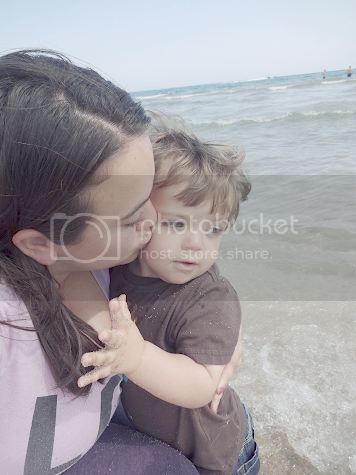 I find my optimism in the fact that the beach is here, it's ours whenever we need it, the warm salt air clearing out Ethan's nasal passages faster than we can keep pulling saline wipes from the packaging. 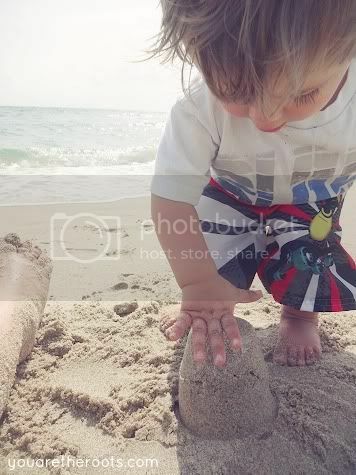 It's here whenever a cold hits for those meandering morning walks in the sand, his little hand in mine. It's easy to find hope when the world around us is so beautiful and the air is so warm and fresh. This month, I had the pleasure of meeting two Florida bloggers: Shary (who I sent a Cara Box to) and Nikki, who sent me this fabulous Cara Box! 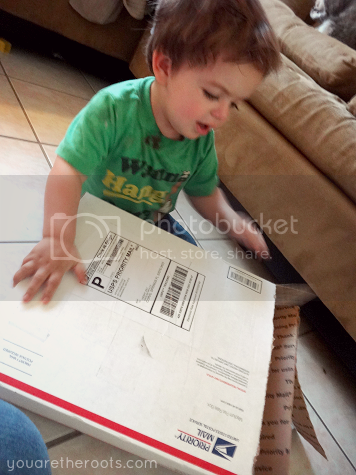 Ethan was super excited when our February Cara Box from Nikki arrived and couldn't wait to open it! 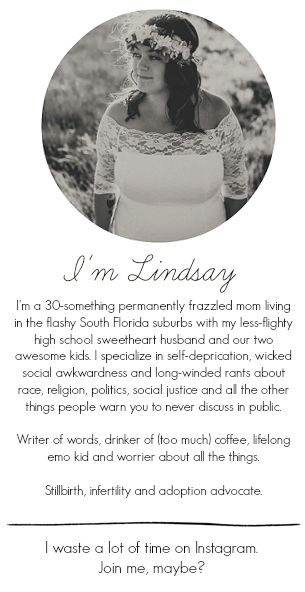 Nikki did an amazing job at sending a box to encompass my ideal night in! 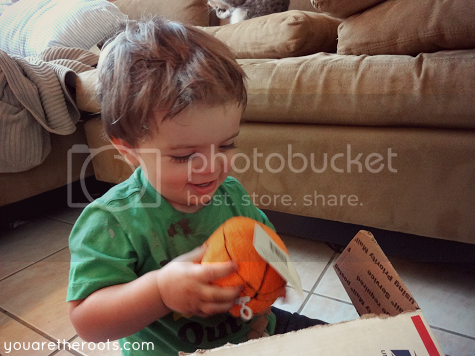 Nikki had sent Ethan a new plush basketball, which made his entire day! My mom had recently gotten him a basketball hoop at her house, prompting a somewhat obsession with basketball in general. He's been toting this plush basketball around with him everywhere since it arrived! 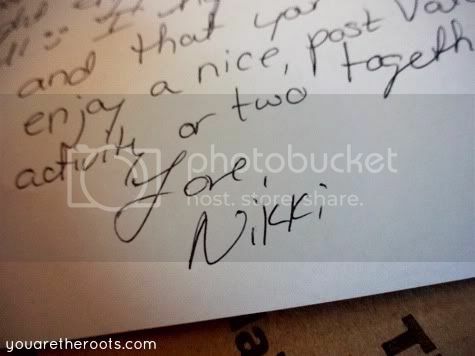 Also, I had told Nikki that I used to be somewhat of a movie fiend, before having Ethan. Since becoming a parent, of course, my time spent at the movies has dwindled down to essentially nothing. 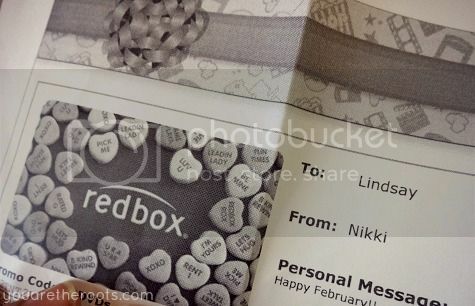 She sweetly sent me a Redbox gift certificate which is so thoughtful and will take care of some much needed at-home date nights for my husband and I. Sitting down to watching a movie is a much better way to spend a night than giving in to the trashy reality television clogging up our DVR! 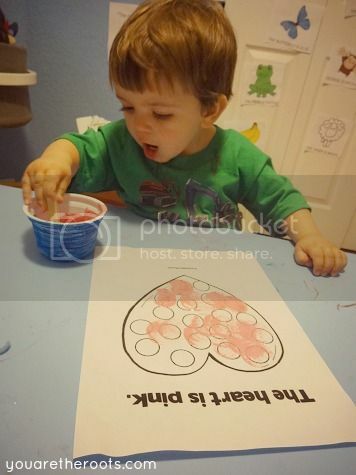 Because I stay at home with Ethan during the week, I told Nikki that I loved doing crafts and other projects with him, and that lately he's been super into helping me in the kitchen. She sent us some goodies for baking and Ethan was super excited about the sprinkles! 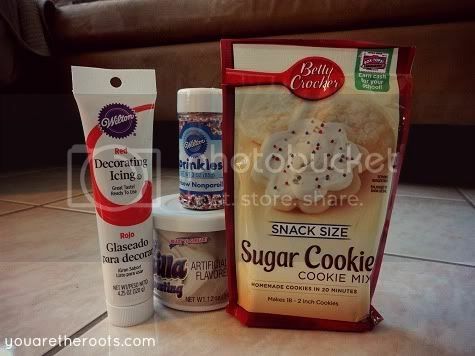 We can't wait to whip up some cookies -- who wants some?! Thank you so much for our fabulous Cara Box, Nikki! To take a peek at what other bloggers got in their Cara Boxes this month, check out the link-up here! Hooray! 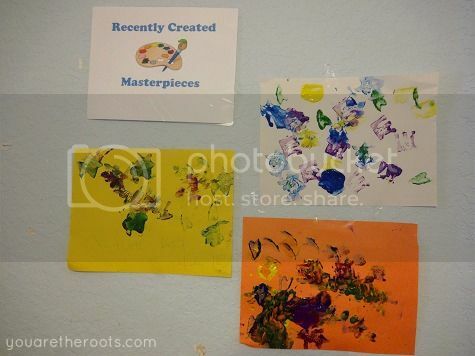 It was our first week back in Tot School in a couple of weeks and it felt great. Though I had intended to coordinate this with Valentine's Day, that failed and we had pink week this past week. 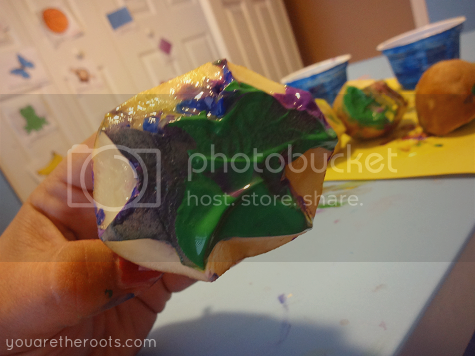 It worked out okay because both Ethan and I were thrilled to resume our Tot School activities and each day was such a blast. 1. 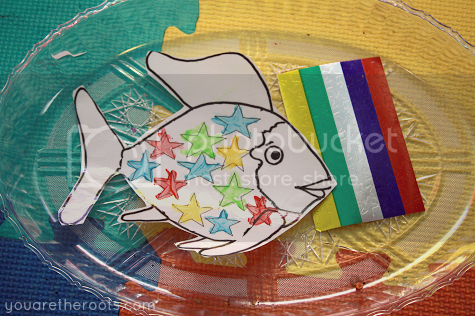 Rainbow Fish Color Matching - I had found a Rainbow Fish coloring sheet online and drawn in little star shapes. Ethan got to match the star stickers to the coordinating color stars in the fish, which we was excellent at minus the fact the star stickers were just a little too tiny for him to handle easily. They kept getting folded over or stuck in between his fingers and he quickly got frustrated and moved onto something else. 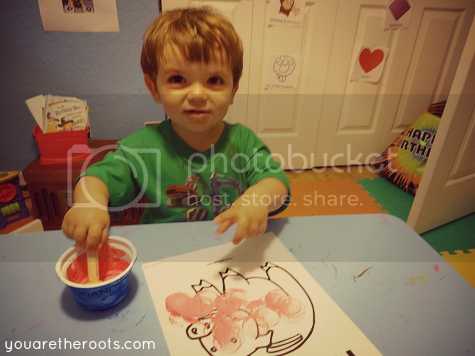 Instead, we improvised by pointing to the star stickers and then to the coordinating colors on the Rainbow Fish print-out and I helped him with the stickers. 2. 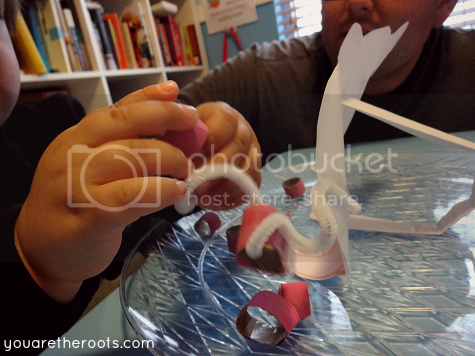 Piggy Tail Stringing - This was the hit of the week! 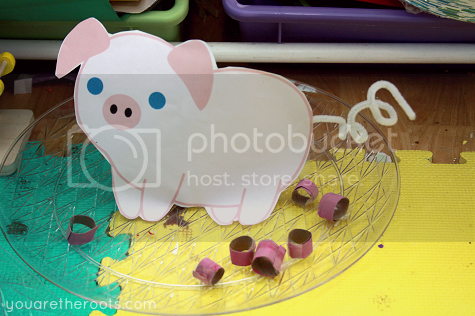 I printed a little pig out online and had my husband create a backing for it so it stood on a tray (neither of us are very crafty -- this was harder than it seemed for us!). Using a pipecleaner, I twisted up the tail into a little curly-cue. 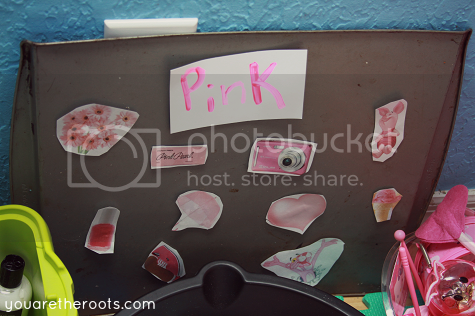 I painted an old toilet paper roll pink and sliced and cut the pieces into smaller rings. 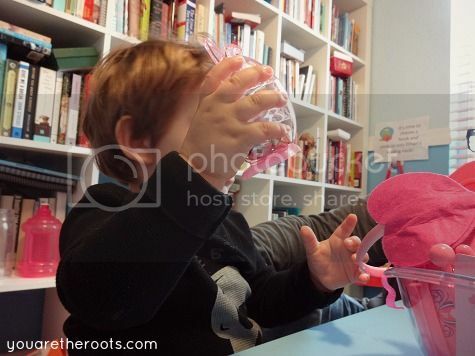 Ethan got to string the pink ringlets onto the pig's tail, which proved to be more challenging than he thought because of the twists in the pipecleaner. It was great to watch Ethan utilize his problem solving capabilities to figure out how to get the rings completely on the tail, be it using two hands or trying to unwind or stretch out the tail as he went. 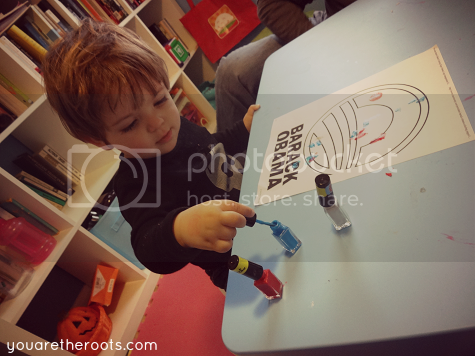 He loved doing this activity over and over. 3. 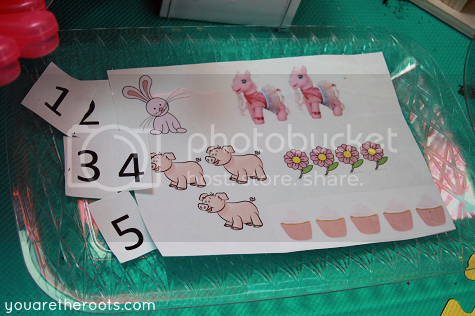 Pink Counting - Just for the fun of it, I thought I'd throw in a little counting activity for numbers up to five. Ethan loved counting each item out with me on the tray, but had no interest in figuring out which numbers went with what. 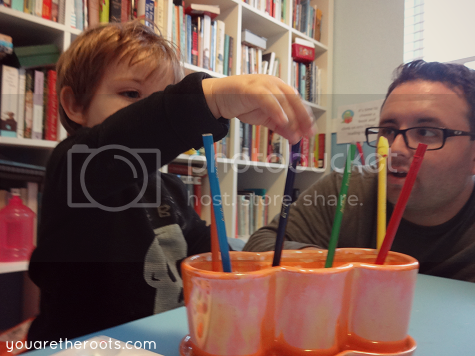 This tray got the least attention this week, other than Ethan pointing out the pink cupcakes and exclaiming "mmmmm!" 4. 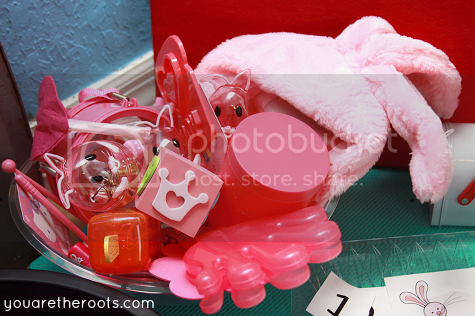 Pink Sensory Bin - The plus to me not being able to get my act together on time for Valentine's Day would be all of the wonderful clearance pink stuff I was able to get my hands on. 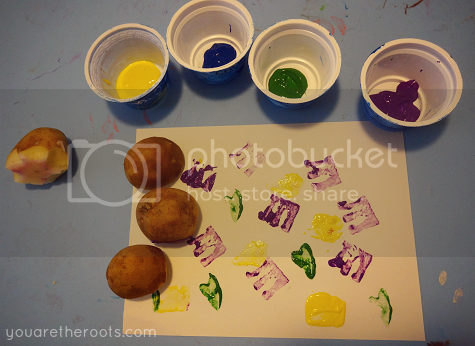 Everything was more or less $0.30 and can be used for so many different activities! 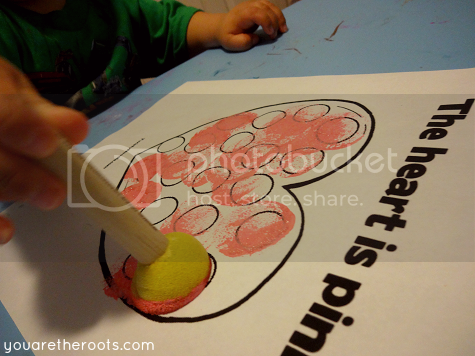 Ethan really enjoyed the sensory bin this week, which included a lot of "dress up" elements, like pink bunny ears, a pink heart headband and lots of crazy and fun Valentine's Day beads. 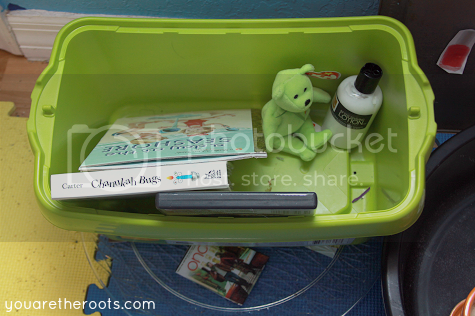 Also included were some random pink boxes with lids he could put things in and some pink Easter eggs that I filled with different items to give them each a different sound when shaken, like bells and rice. 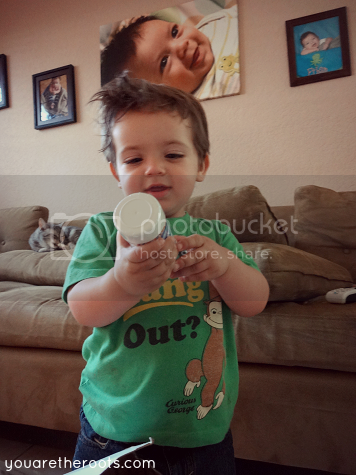 Ethan's favorite item in the bin would be the pink popsicle shaped bubble container. 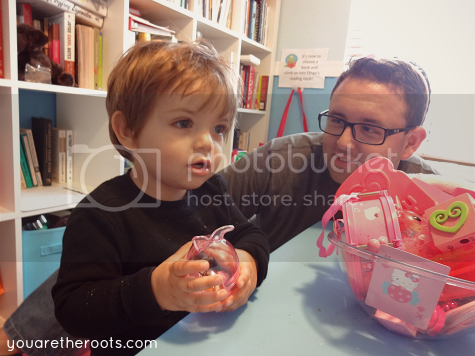 He had a blast blowing bubbles in Tot School this week! 5. 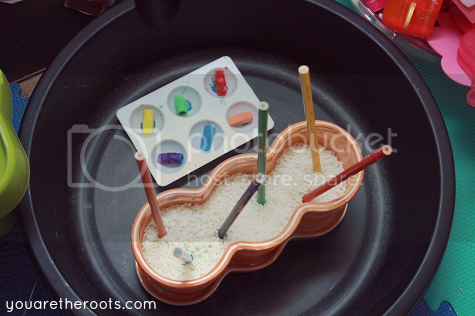 Pencil Garden - I filled a herb planter with rice and stuck in different colored pencils. I put out a little palette with matching pencil toppers. 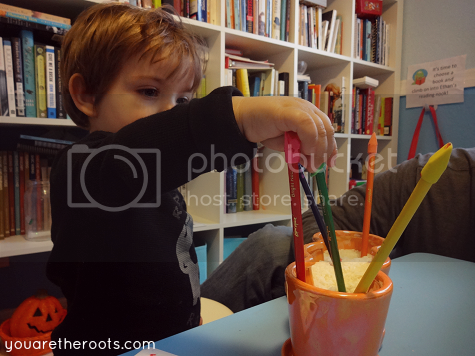 Ethan enjoyed the way this activity looked but found it a little difficult to get the pencil topper erasers on, even though he knew which pencils they matched up with. 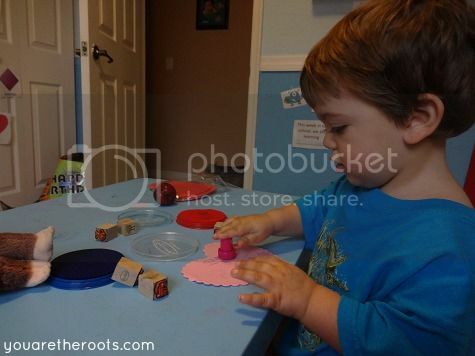 My husband and I both had to really use two hands and maneuver the erasers on, which I wish I would have noticed before I put it out for Ethan -- this frustrated him so much! Still, we had fun doing this activity together until Ethan realized the pencils (which were in point down) had points for coloring. 6. 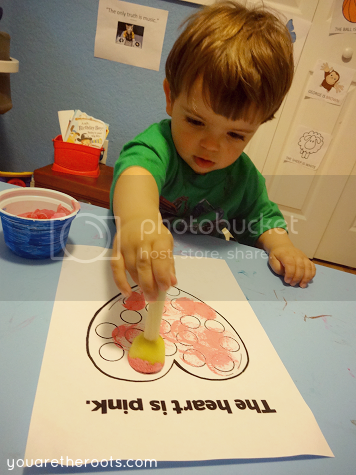 Pink Magnet Board - This was another flop this week, despite the magnet board usually being Ethan's favorite. I'm thinking he's just over the magnet board by now since it exists each week. 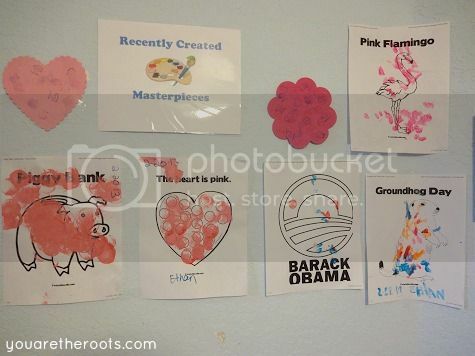 That, or there weren't exactly many exciting or familiar pink items that I was able to include on the magnet board. 7. 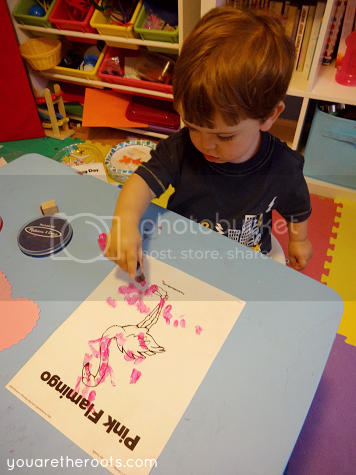 Object To Photo Matching - Ethan really loves matching objects to their corresponding pictures. This go round, I wanted to include items he didn't see regularly or wasn't familiar with, including an aftershave belonging to my husband and one of my favorite DVDs. He's always so proud when he gets the entire tray right with ease! 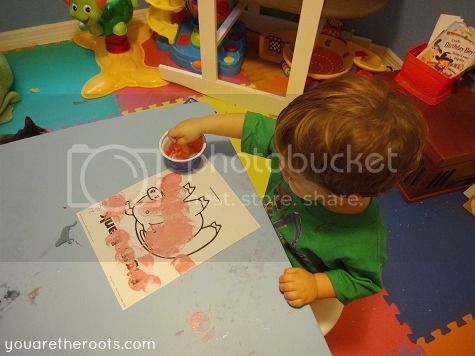 Otherwise, we just did lots of pink art. 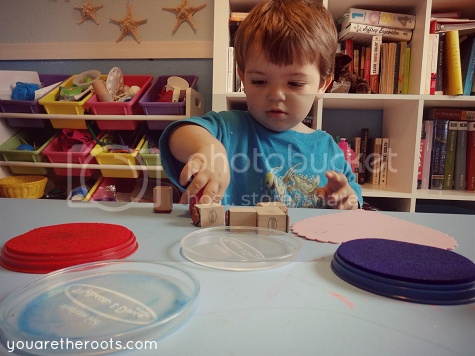 Ethan really loved these foam stampers. We didn't make it to the library this week. I'm having library zoning issues that I'm trying to get worked out. Until I succeed, we're just rereading Ethan's books that he has at home. 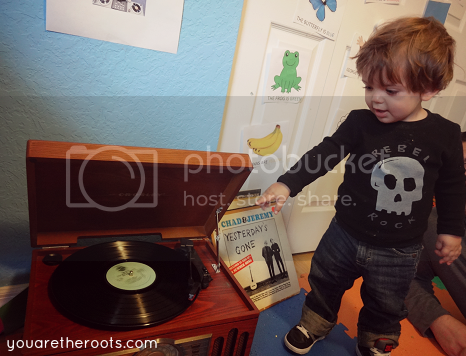 He did get a kick out of our new music listening space, and we spent a lot of time relaxing and listening to music or putting on music to inspire us while we made art.